Plan your weekly guitar practice objectives. Set your daily and weekly goals. Create a new practice schedule for each day and week. Record your actual practice time each day. Track and log your daily progress in tangible and quantifiable ways. The Practice and Progress Log Book is a workbook designed to help you do all of this. It has been proven to be very effective and music teachers, music schools plus tons of students are using this book right now and experience exceptional results from their music lessons! 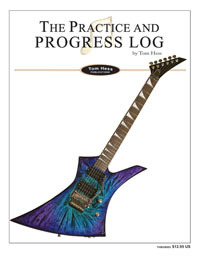 Every guitar and bass student regardless of age, style, skill level or musical goals will benefit greatly from using this book. Wholesale pricing is available to music schools, teachers and retailers. Contact us for more information.